The New Horizons probe celebrated the New Year by flying by the unique trans-Neptunian object 2014 MU69. Credit: NASA/JHUAPL/SwRI/Steve Gribben. It took nearly a decade for the New Horizons probe to reach its main target, Pluto, but it was certainly worth it! For the longest time, Pluto was a very mysterious world that we knew almost nothing about. As New Horizons flew by Pluto and took high-resolution images of the dwarf planet, we soon discovered that it had an atmosphere and a surprisingly complex terrain. After New Horizons’ successful Pluto mission, it received an extension into 2021 to explore Kuiper Belt Objects (KBOs) beyond Pluto. 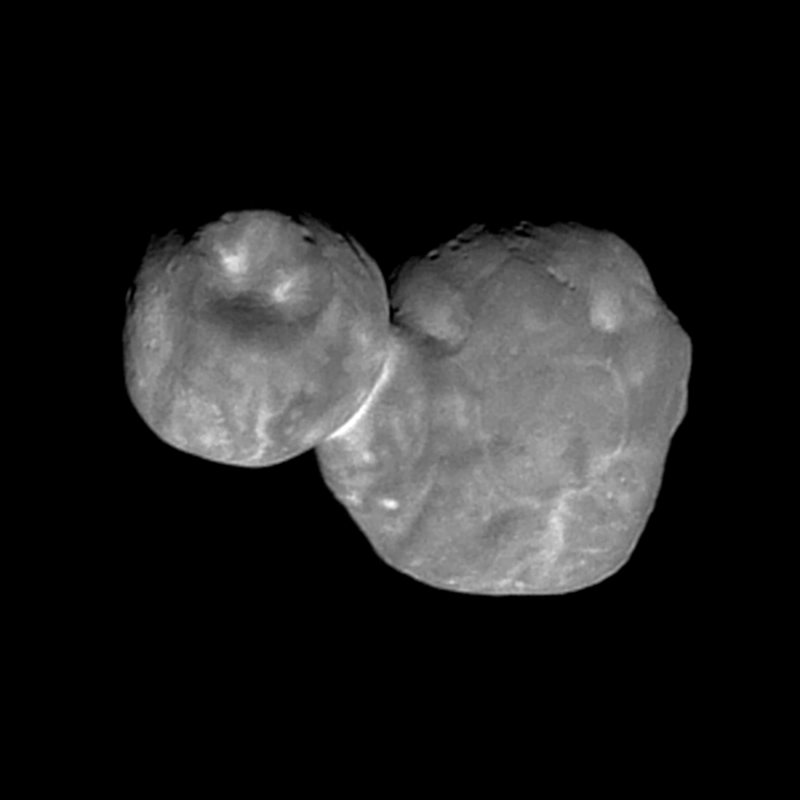 New Horizons flew by 2014 MU69, a trans-Neptunian object that is also a contact binary formed by the very gentle collision of two smaller objects. Credit: NASA/JHUAPL/SwRI. The Kuiper Belt is a region of the outer Solar System extending beyond the orbit of Neptune out to 7.5 billion kilometres from the Sun. While the Asteroid Belt is filled with rocky objects, the Kuiper Belt’s objects are composed mostly of ices such as water, methane and ammonia. These small objects are leftovers of the formation of our Solar System and can act like a fossil record of this time in our history. 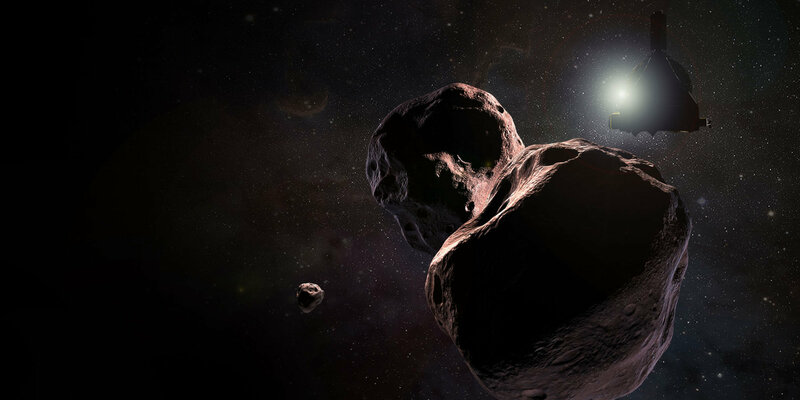 The trans-Neptunian object 2014 MU69 was chosen as New Horizons’ first target beyond Pluto because it only required a small shift in the probe’s trajectory for the flyby to occur. On January 1st 2019, MU69 became the farthest object ever visited by a spacecraft in our Solar System when New Horizons performed its flyby. New Horizons came within 3,500 km of MU69 which is 31 km long. As clearer images were taken of MU69, scientists determined it belonged to a class of object called “contact binaries”. Small bodies in our Solar System can sometimes collide in such a gentle manner that neither object is greatly transformed by the collision, but the two objects are now stuck together to form a single object. Contact binaries are crucial in understanding how larger objects in our Solar System were formed from smaller building blocks. Prior to this observation, scientists did not know if MU69 was a single object, two objects or a contact binary. After having performed its flyby of MU69, New Horizons still has enough power to remain operational until the 2030s. Objects in the Kuiper Belt are very distant from each other, however, which means it may take some time into the 2020s to find a third suitable flyby candidate. There are also plans for New Horizons to turn around to take a picture of the Earth from the Kuiper Belt, similarly to the famous “Pale Blue Dot” image taken by the Voyager satellite on its way out of the Solar System. This would not be done until New Horizons has completed all of its KBO flybys however, as the maneuver may risk the probe’s camera being damaged by sunlight.